The black Airport Navigator Rolling Bag from Think Tank is filled with features that make it a good choice for the pro who shoots weddings, events and travel photography. It features a good size capacity with space for two pro-size bodies that fit side by side with lenses attached up to a 70-200mm f/2.8 with hood reversed, plus 3-6 extra lenses and accessories. There are also dedicated pockets for your iPad and up to a 15.4" laptop. Configurable touch fastened padded dividers allow you to arrange the interior to suit whatever gear you need on a given day. This rolling bag includes user-replaceable in-line wheels as well as a user-replaceable 41" tow handle. Its Low Rider shoulder strap doubles as a trolley sleeve that can fit over a larger, optional rolling cart. The retractable handle can also slide through the trolley sleeve to hold the top compartment open. A top grab handle is also included for quick retrieval from a luggage rack, closet or car. The main compartment storage compartment can be accessed via either top or front YKK zippers. The bag's front access also contains support straps on both sides that hold the compartment open at a comfortable angle and also prevents the contents from spilling out. The three-sided top zippered opening has mesh pockets underneath for small accessories such as cables, batteries and cell phone. Two side pockets are provided and sized to hold your flash units or water bottles. A zippered card slot on the top of the lid is a good place to store your passport, ticket and other quick access items. The zippers on the top and front compartments are lockable with user-supplied locks. The exterior is made from a combination of water-resistant polyurethane, nylon and polyester. The interior is polyethylene with closed-cell foam, nylon and mesh. The zippers are all YKK in design. A rain cover is included to protect the entire bag when outdoors. The Airport Navigator Rolling Bag comes with a limited lifetime warranty against manufacturer's defects. 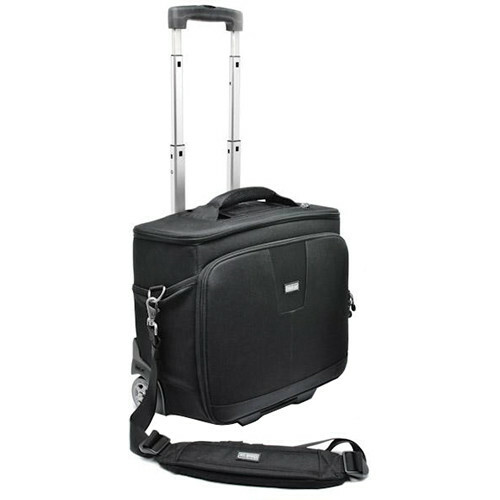 Box Dimensions (LxWxH) 17.0 x 17.0 x 11.0"
Airport Navigator Rolling Bag (Black) is rated 4.6 out of 5 by 81. Rated 4 out of 5 by CT from LOVE this bag! I was getting back pain and inflammation from carrying a backpack around. I had not choice but to purchase a rolling bag. At first, I was going to buy something less expensive but realized that I needed something that looked professional, had enough room for all my gear, and would last. I'm sold on Think Tank. Yes, they are expensive bags but I figured that it was the best way to take care of my body and my equipement. I love the compartments for laptop and tablet and paperwork. I wish there was more room for accessories and incidentals. THere's not much room for the extras which is why I gave it four stars. Overall, a great bag. Rated 4 out of 5 by Patti from This is a very nice rolling bag! When I first received this case, it looked very small inside and I didn't think it would hold everything I would want to take on a trip. But once I sorted out what I would actually carry and rearranged the compartments, everything fit. (My largest lens is a 100-400 Canon lens. )I love being able to access my camera from the top. Structurally, Think Tank makes an excellent product. This is no different. Great zippers, nice material, secure handle. I gave it 4 stars for one reason - to access the rest of your gear, you unzip the front compartment and the door only releases part way. It would be nice if you had an option to open it all the way if you needed to. Rated 5 out of 5 by Iopine from More uses than camera bag A really good bag and not limited to the carriage and protection of camera gear as well. I removed the insert and use the shell to carry my laptop and other paraphernalia for work purposes. The bag handles this task more than adequately although I am careful not to overload and keep in mind the weights of the camera equipment normally carried. The axle and wheel mechanism is robust and smooth too.The camera insert has plenty of room for the assets I carry, a D800 and 4 lenses with a single flash. A great travel bag with room also for a book/kindle and travel docs that can be accommodated in the two side pockets. Rated 4 out of 5 by Ann from Good travel bag This is a great bag for air travel, or for wheeling around anywhere. I have a bad back, but use a Nikon D800 and Nikon 70-200mm lens quite a lot...and they are heavy. So am very pleased to have a bag that can accommodate a lot of gear, but still allows me to wheel it. Only wish is that it had an outside pocket for those extras like memory cards, lens cleaning cloth etc. I can stuff them inside, but it would be nice to have a dedicated area that could be zipped closed. The two side pockets can hold a water bottle, but I wouldn't want to store valuable gear there. As with other Think Tank products, it is extremely well made. Rated 4 out of 5 by Zach from Wanted to liked it more - a tad small Everything you'd expect from a Think Tank. Great build quality packs A LOT in a tight package. As I'm a videographer and often need to bring a small sound kit with me, this bag was just a hair too small. The bigger problem for me was that the top loading camera bays were too wide for my Panasonic GH line cameras, which are smaller than standard SLRs. They did not feel properly secure. If you need more space, I replaced my Navigator with a Think Tank's Roller Derby & it's the best bag I've ever used. Rated 4 out of 5 by Howdo from Works for me, but heavy I was surprised when I opened the box and noticed how heavy it was. I guess it's because of the sturdy build. Thank goodness it has wheels. I checked the specs and they disclose the right weight. I bought this to transport two SLRs, four lenses and support gear when I travel. It's just the right size and the innards offer infinite options for organization. For short trips I can even fit a change of skivvies and toiletries (in leak-proof containers, of course). What more could you want? Rated 5 out of 5 by The photographer's husband from The perfect traveling bag I bought this bag for my wife who has been carrying around two proDSLR camera bodies and about four different lenses in duffle bags with padding. This bag is great because not only is it easy for her to safely stash both cameras (with lenses attached) but she has room for everything else like her two flashes, additional lenses and computer charger and other cords. This bag also fits and protects her Macbook Pro perfectly. Wheels seem to roll effortlessly and the quality seems to be top notch. Also nice that it came with the shoulder strap although I think this would get pretty heavy if she had all of her equipment in it at one time. Will this bag hold a canon 6D + 7D with battery grip and sigma 150-600mm and canon 70-200mm lens attached with space for extender and 24-70mm including a macbook 13 ? Will a Canon 100-400 lens fit in with the body and another smaller lens? will this bag fit under the airplane seat in frontwill this bag fit under the seat in an airplane? Would this fit a canon 1dx mark II with a 70-200mm lens ?? Indeed it will, easily along with another body and more lenses.